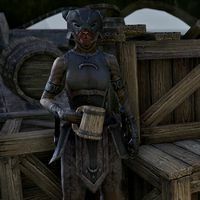 Burnscar is a Khajiit member of the Renrijra Maor found in the port town of Alten Corimont. She works for Tsanji. Burnscar is one of three pirates who must be approached and convinced to cooperate with your investigation. Killing nearby Dominion personnel makes this easier. "You heard about Lady? She's the new boss in town ... or she will be! Ha!" "Well, now she's a popular one. Word's out that she's got money, hrr? What makes you think you'll take a piece of the cut?" "Good point. I prize my pelt. You'll need this key to get into her hideout. Now you've got nothing to complain about, right?" This page was last modified on 6 April 2018, at 19:36.